Want to become a freelance copy editor but not sure how to get started? We'll clue you in on what you need to know and how to get started in finding the perfect freelance position. Copy editors are the grammatical gatekeepers, of the written word. They prepare copy for production – whether it's in print or on the internet. They read over the copy and correct everything from typos to missing or extra commas before it is made available for the public to read. Technically, there is no formal training required to become a copy editor. But a degree in English, Journalism, or Language Arts is usually the norm. Most copy editors also have a love of the English language. 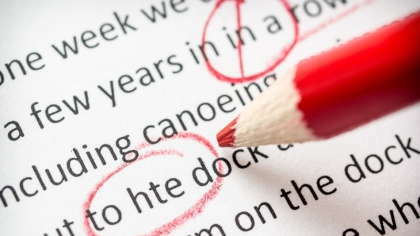 Most copy editing jobs require its applicants to pass a test, which include editing a written piece and correcting the mistakes to prove that you know how to do the job for which you are applying. Most companies require their Copy Editors to understand the rules of the style guides which gives the basic rules of grammar when writing addresses, titles and numbers. There are several different styles guides available such as: the AP Style (Associated Press), APA Style (American Psychological Association), Chicago Manual of Style (or Chicago/Turabian Style), and the MLA Style (Modern Language Association). Wannabe copy editors should know the rules of all of the style guides before applying for jobs as a copy editor. Years ago, copy editors were only known at newspapers and publishing companies, but today nearly every company is producing content – printed and online– in which a copy editor would come in handy to check grammar. As a freelancer, you can work from home for any company. You can provide style and grammar consistency and fact-checking for writers, organizations, publishing companies, and other private businesses. The first thing you should do is finalize your resume. Be sure to have some copy writing examples available as a portfolio (perhaps set up a website to showcase your work and be sure to include testimonials). Before and after work are always good samples to have as a copy editor (before the edits and after your edits are made). Then you’ll have to set an hourly rate and flat rate per project, page or word. Make sure you are setting rates so that you turn a profit. It is possible to make a good living being a freelance copy editor if you’re good at what you do. You have to take the time to promote your talents, work hard at finding the work, and then the work will come.